Yikes, it's only two weeks until Christmas! The recordings were cylinders and acetates from 1898 to 1922. Every year after the release, the website was inundated with requests for the CD. Once it was out of print, Dawn of Sound released it online for free. 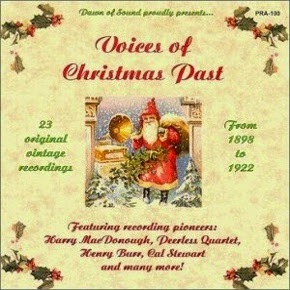 The 23 tracks include religious songs, kiddie songs (Did you know that Santa hid inside the phonograph? ), stories, comedy routines, some visions of sugar plums and herald angels, a little Nutcracker Suite, and an early, early version of "Jingle Bells." No known copies of the Will Lyle recording exist, Nagy said, But Track 3 in this collection, an 1898 Edison brown wax cylinder titled, “Sleigh Ride Party,” featuring the Edison Male Quartette is centered around "Jingle Bells. This collection of carols, songs and monologues from the original vintage recordings capture the essence of the Christmas spirit as it was in the opening two decades of the 20th Century. So gather up the family, wind up the phonograph and take a trip back in time to the early 1900’s and celebrate the holidays with the “Voices of Christmas Past”. You can play it below and download any or all of the songs at FMA. Alas, it looks like the Dawn of Sound blog has been inactive for a few years. But it's still up for all to enjoy.